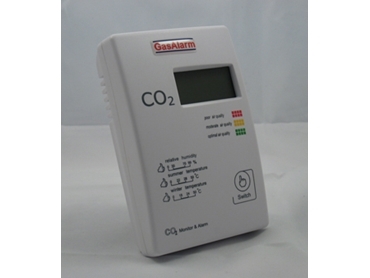 Gas Alarm Systems (a div of Alvi Technologies ) has launched the GAS-CO2-002-CDR Infra-Red CO2 Room Controller for continuous real time monitoring of CO2, temperature and humidity. It has a backlit colour display which switches depending on CO2 concentration signifying ventilation condition (optimal / moderate/poor). The CO2 measurement is more accurate and reliable due to NDIR Infra-Red CO2 sensor inside with special self-calibration feature (no service/maintenance or calibration required). It can be set for auto-operation or manual ON/OFF of ventilation fan with a touch button. It can be supplied with 1 x control relay (standard) for controlling the fan or with 1 x analogue output (4-20mA/0-10 V). It has a range of 0-2000 ppm CO2 and works on 100-240 VAC power supply. It is designed to be installed in building, conference centres, offices, churches, schools, universities for monitoring of Indoor Air Quality (IAQ) and for fresh air fan control to save energy (green house gas saving), and get carbon credit with demand control ventilation (DCV). NDIR infrared CO2 sensors inside with special Self Calibration System. It makes the CO2 measurement more accurate and more reliable in use.